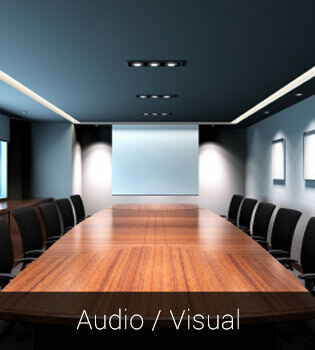 Displays: Upper and lower, each with adjustable backlighting. Upper display is three-line, 56-characte. Lower display (which shows settings of programmable feature keys) is 16-line, 13-character. 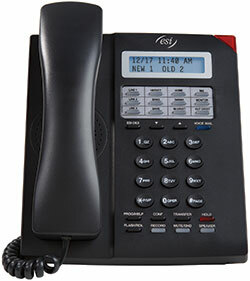 An ESI 40 business phoneprovides a full feature set to users who may not need all the “bells and whistles” of higher-level models yet do require access to all ESI system features. Each ESI 40 model has a sealed membrane below the keys to make it virtually spill-proof; and the sturdy multi-position angled base lets it fit on any desk or counter space so you can easily see the status of the display and keys. Each ESI 40 model also can be wall-mounted. It includes an adjustable backlit display and a speakerphone. 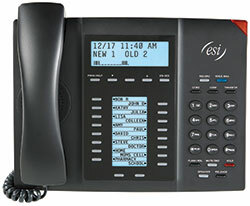 ESI 40D (digital) Business Phone Systems: IP Server 900; ESI Communications Servers; ESI C-Plus Executive. 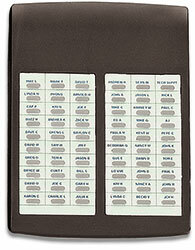 Programmable keys: 16 [up to 136 with optional Expansion Consoles1 attached]. 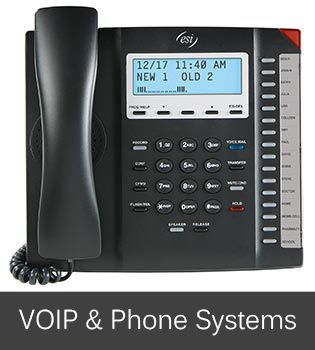 ESI 40IP Business Phone — Provides the same great ESI phone capabilities as does the ESI 40D Business Phone, yet with the additional advantage of “one-wire” VoIP (voice over IP) telephony. Works both locally (LAN) and remotely (WAN or Internet). Uses either Power over Ethernet or regular AC power, to maximize your connection convenience. 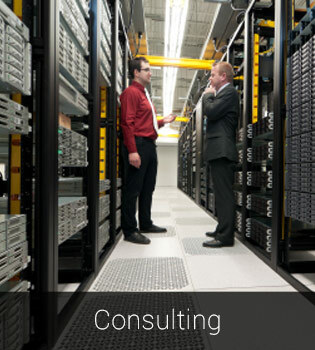 Systems: IP Server 900; ESI Communications Servers [when IP-enabled2]. 48-Key IP Feature Phone II — Provides the same great ESI phone capabilities as does the 48-Key Digital Feature Phone, yet with the additional advantage of “one-wire” VoIP (voice over IP) telephony. 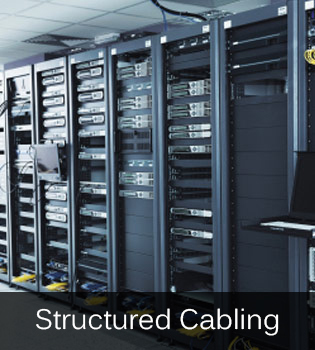 Works both locally (LAN) and remotely (WAN or Internet). Uses either Power over Ethernet or regular AC power, to maximize your connection convenience. 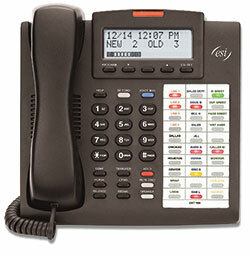 Business Phone is perfect for lower-traffic users who need access to system features but require less customization. The ESI 30D has a sealed membrane below the keys to make it virtually spill-proof; and the sturdy multi-position angled base lets it fit on any desk or counter space so you can easily see the status of the display and keys. 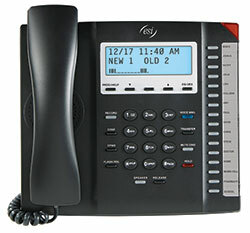 The ESI 30D also can be wall-mounted and has a speakerphone. 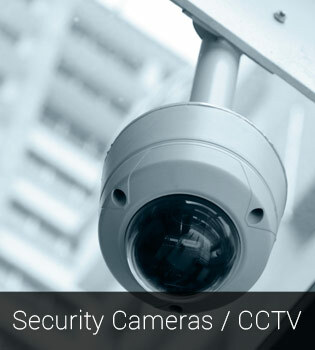 Features Systems: IP Server 900; ESI Communications Servers; ESI C-Plus Executive; IVX C-Class. Easy to use - Lets your operators transfer calls to any extension with just a keystroke. Powerful - Adds 60 more programmable feature keys to the 30 already on an ESI 48-Key Feature Phone, giving the user a total of 90 such keys. Easy to understand - As does each ESI Feature Phone, uses tri-color LEDs to show the simultaneous status of all extensions programmed into the soft feature keys. Versatile - Combines with an ESI 48-Key Feature Phone for any extension. Compact footprint - Takes up little valuable workspace, especially since it has a convenient four-position base (to match the ESI 48-Key Feature Phone's). Powerful - Adds 120 more programmable feature keys to the 30 already on an ESI 48-Key Feature Phone, giving the user a total of 150 such keys. Your ESI 48-Key Feature Phone can support up to two optional Expansion Consoles, for a possible total of 120 additional programmable feature keys. The 60-Key Expansion Console connects directly to the phone, while the Second Expansion Console connects to the first Console. 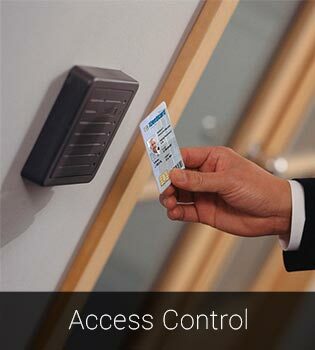 You program each Expansion Console’s keys just as you do the programmable feature keys on your ESI Feature Phone, using either direct or traditional programming. ESI Mobile Messaging combines the advanced capabilities of your ESI business communications system with the convenience of users’ existing e-mail accounts. When you receive a message (a voice mail or a recording) at your extension or guest mailbox, you also receive an e-mailed notification to which a .WAV of the message is attached. 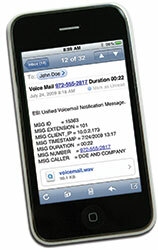 The notification’s header contains information about the message — the Caller ID name and number, as well as the call’s date, time, and duration.